In London, tourists happily buy T-shirts and mugs with the city’s iconic Underground logo or “Mind the Gap” slogan. The New York subway’s signage for famous stops like Grand Central or Penn Station is immediately recognizable throughout the world. These dense, global cities can market public transit as fun, stylish, and efficient. But visitors to Los Angeles probably won’t commemorate a bus or Metro ride with a souvenir—they are more likely to get stuck in traffic after landing at LAX. Could L.A. improve mobility—and achieve worldwide renown—by emulating transportation systems in other global cities like London or Hong Kong? In advance of the Zócalo/Metro event “Is L.A. Mobile Enough to Be a Global City?”, we asked transit experts, planners, and scholars to tell us what global cities L.A. should look to as a model for a 21st-century transportation system. When it comes to transportation problems, Los Angeles has surprising similarities to Paris—not just in the structural role played by the great boulevards of both cities. While Paris is certainly denser, both cities share a pattern of decentralized density with major job destinations near the edges, not just in one big mass in the middle. This happens to be the perfect geography for public transit—much better than New York or London with their massively concentrated downtown jobs. In L.A., people are going everywhere, all day, in both directions, so the transit market is balanced, without the huge cost of moving empty trains and buses that were used only one-way at rush hour. But a recent move makes Paris an even better model for L.A. When I lived in Paris in the 1980s, the bus system was slow and unreliable. But in the 2000s, Paris banned private cars with single passengers from one lane of every boulevard so that the bus system could actually function. There was no cautious demonstration project in one area. Planners understood the basic math of urban space, so they just did it, everywhere. These lanes can be used by other vehicles that carry many customers. And they also save lives, because emergency vehicles are rarely stuck in traffic. Surface transit in its own lane is the only transportation solution that could actually make it possible for Angelenos to get places on time, and for the city’s economy to grow beyond the limits that car congestion imposes. For now, that means buses, because only buses can be delivered at the necessary scale soon enough to matter. Later, some of the bus lines might turn into surface rail. The Los Angeles rail program is great, but even in 20 years, rail won’t be there for most of the trips people make around L.A. Meanwhile, taking a lesson from Paris, it’s time to let the bus system succeed. Jarrett Walker is an international consultant in public transit network design and policy, with over 20 years of experience in projects across North America, Australia, and New Zealand. He is the president of Jarrett Walker and Associates in North America and also serves as Principal Consultant with MR Cagney Consultants in Australia. For as long as I have lived in the L.A. region (many decades), there has been angst over whether Los Angeles is a “global city.” The global city narrative is about New York, London, Tokyo: large cities that are the financial control centers of the global economy, with very dense cores, astronomical land prices, and of course extensive rail transit systems. But L.A.’s bone structure is different. It has multiple “downtowns.” The formative years for L.A. were in the 20th century—the century of motorization—and the region literally formed around highways and freeways. Bottom line: Los Angeles is fundamentally different from the conventional concept of a global city. Therefore there is no model global city to which L.A. should aspire. A fully integrated public transit system that is easy to use and easy to navigate: Hong Kong and Tokyo both boast a one pass, one source of information system for all transit services. Street space is scarce, so we should give buses priority when justified by demand, as in Bogota or London, or give priority to pedestrians and bicyclists when appropriate, as in New York or Toronto. Solve the LAX airport connection problem: A global city needs a direct connection from the airport to its public transport system. Continue to experiment with pricing in order to provide more alternatives to travelers: Road pricing is an integral part of transportation management in London, Seoul and Paris. Genevieve Giuliano is the Ferraro Chair in Effective Local Government, professor and director of the METRANS Transportation Center, Sol Price School of Public Policy, University of Southern California. Los Angeles natives know that “L.A.” means not just the City of Angels with its scores of neighborhoods, but also a county with 88 municipalities—and even the entire Southern California region with far more. What unites a salad bowl of culturally diverse residents and communities is a shared, ingrained concept of mobility: L.A.’s car culture makes us all equal behind the wheel. The city’s public realm is its interlocking system of freeways. But, despite our myriad languages and political differences, we Angelenos bemoan this one common truth: “Come for the sunshine; get stuck in traffic,” as a proposed L.A. slogan says. How to get unstuck? To drive or not to drive? Increase capacity by building multi-level freeways (as opposed to building better schools)? Stop building roads (like in Melbourne) so disgruntled drivers will eventually go nowhere and demand an effective, on-street alternative, i.e. an attractive bus system with short headways? Increase vehicle occupancy through better incentives for carpooling? Build more light rail lines with local shuttles covering that last, difficult mile to the station? Build and regulate dedicated bikeways? These measures rest on creating not just a comprehensive regional transportation plan but also a strong regional government in the face of towns that fear its encroachment on their self-determination. City planners like looking backward nostalgically to the days when the Red Car crisscrossed the area, or romantically to the mass transit systems of Portland and London, to bike-loving Amsterdam and Curitiba, all centralized cities with strong local control. Today’s L.A., for better or worse, is as modern as it gets and a global force like nowhere else. We won’t overcome our infamous traffic until we start looking inward seriously—beyond transit—to how we operate as a region. Until then, give me a special license plate with access to “natives-only” lanes and free, unlimited parking. Julianna Delgado, is the interim associate dean of the College of Environmental Design and professor of urban and regional planning at Cal Poly Pomona. A founder and co-director of the California Center for Land and Water Stewardship, president of the Southern California Planning Congress, and former chair of Pasadena’s Transportation Advisory Commission, she was born in L.A. and carpools to work. 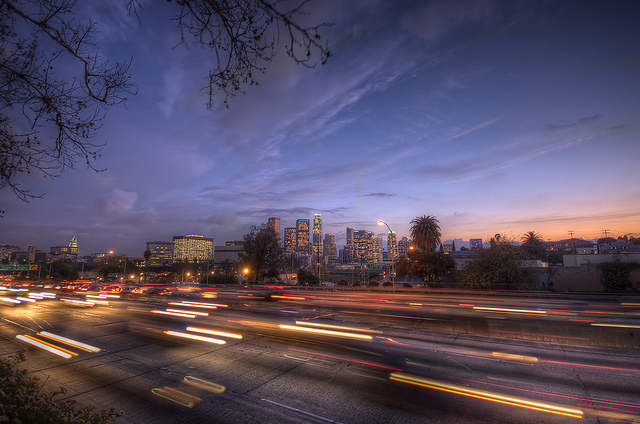 What global city should Los Angeles look to as a model for a 21st-century transportation system? This is actually two questions: 1) Who should Los Angeles emulate in bringing transit to the city? and 2) Who should Los Angeles emulate in bringing the city to transit? If Los Angeles is to remain mobile, it must become a more transit-oriented city—the solution cannot be car-based. The city doesn’t have physical space for millions of cars. But there is also no model for how to bring (more) transit to L.A., the city of “dense sprawl.” The Los Angeles Urbanized Area—which includes most developed areas of Los Angeles County as well as northern Orange County—covers over 1,700 square miles, most of it containing populations dense enough to warrant transit. Other transit-rich cities with a single strong core—New York, Montreal, Berlin—cannot serve as a model for “polycentric” L.A. The key task for the L.A. transit system is serving short- to medium-length trips. The average trip in L.A. County by any mode is 7 miles (the median undoubtedly less). The challenge is developing a network—using trains, freeway buses, and buses on arterials—that serves everyone, from South Park to South L.A. to Santa Monica. Given the fiscal, physical, and political constraints, L.A. has made mostly reasonable choices of transit investment. Bringing the city—apartments, offices, stores—to transit has been spottier. L.A. now has 98 rapid transit stations and hundreds of major bus stops. Yet these important urban investments are often surrounded by uses that don’t generate urban life, such as warehouses and parking lots, rather than dense urban development. In Portland, towns must rezone for higher density housing to get rail extensions. San Diego, Washington, and Toronto are among the cities that have been effective at transit-oriented development. Some transit hubs need more amenities and culture nearby, while some cultural centers need a location closer to more transit. For example, reaching the Getty is unsurprisingly difficult—it is located on an isolated, transit-free hillside; newer museums—like the Broad, which is currently under construction downtown—have picked more accessible sites. Such moves are among the many that will help make Los Angeles a leader in transit, as it once was. Nathan Landau is a transit and land use planner. He is the author of Car Free Los Angeles and Southern California (Wilderness Press) and Designing with Transit: Making Transit Integral to East Bay Communities (AC Transit). 1) Cities that are promoting a people-centered culture that includes non-motorised transport–walking and cycling–are showing that it is possible to change how people interact with each other and public space. A range of global cities—including Bogota, Colombia, and Copenhagen—are democratizing space and reprioritizing budgets in line with people-centered transport choices. 2) Making public transport cool while also providing efficient, safe, and reliable services is an important element in getting car-captives to make the shift to transit. Expertise and resources must be dedicated to slick marketing campaigns with emotional appeal. These need to be supplemented with carrot and stick approaches that reward public transit users and penalize drivers, like those currently being used in Singapore. 3) Citizens are making lifestyle choices that do not see them spending inordinately large chunks of their day sitting in stationary vehicles frustrated in traffic jams. Changing job hours and telecommuting are dictating a different way of moving through cities. – Be as affordable and have as few vehicles as Hong Kong.